La La Land Home Entertainment Review: What to make of this musical dream? | SWITCH. WHAT TO MAKE OF THIS MUSICAL DREAM? If you’ve been aware of cinema at all over the last six months, you probably have a very strong opinion about ‘La La Land’, whether you’ve seen it or not. The divisiveness of film is what makes it such an exciting art form, but I’ve never quite seen anything like this one. It exemplified the “love it or hate it” mentality, with battle lines being drawn between film buffs and social media descending into a kind of battleground over whose very strong opinion is more correct, to the extent that it was impossible to see the film for the first time with a truly objective opinion. What makes this response so bizarre in hindsight was that the film itself, Damien Chazelle’s Oscar-winning ode to the classic movie musical, didn’t warrant in terms of its quality anywhere near the debate it created. I have no shame in admitting that I absolutely love the film, but it is neither a modern masterpiece that needs defending nor an abominable mess that should be vilified. In the end, the argument around the value of ‘La La Land’ was far more bombastic and dramatic than the actual film itself. There’s an unexpected simplicity to ‘La La Land’ - its narrative is fairly straightforward, its characters aren’t that unusual, the songs are functional if mostly unremarkable. The surprise of the film is its enormous ambitious and (I think) artistic rigour. Chazelle sent shockwaves through cinemas with his second film ‘Whiplash’ (2014), a fire-and-brimstone masterpiece executed with shocking dexterity and imagination. He brings that same level of artistic rigour to ‘La La Land’ with often spectacular results, though the material means it never quite hits with the same force as ‘Whiplash’. At its heart though, it continues his exploration of the cost of being an artist - the personal, financial and social sacrifices that have to be made. There is a cynicism to ‘La La Land’ hidden under the romance, a cynicism that actually makes the film a more rewarding experience on rewatching. Mia (Emma Stone) and Sebastian (Ryan Gosling) aren’t a perfect couple, or even a particularly functional one, but perhaps that’s the point. The film appears to view their relationship with rose-coloured glasses, but flashes of acidity betray a more balanced perspective that romanticism of their relationship prevents it from being a mature one. For all its flaws (and even I will acknowledge there's quite a few), I think there’s far more to be amazed by. Chazelle might not have entirely landed the screenplay, but his direction is breathtaking, often spectacular. He continues to offer a perspective on how to approach cinematic storytelling that’s entirely unlike anyone else, so that for every nod to ‘The Umbrellas of Cherbourg’ and ‘Singin’ in the Rain’, he throws in something thrillingly original. And even though the songs might not always hit the mark, Justin Hurwitz’s score is a masterpiece, a gob-smacking achievement that not just lifts the film but often surpasses it. Almost all aspects of technical filmmaking in ‘La La Land’ are thrilling, from the rich cinematography to the gorgeous production design. And even though it may not be entirely Oscar-worthy, Emma Stone delivers her finest performance to date, a beautifully nuanced demonstration of her enormous talents. In the end, it really is the earnestness that either makes or breaks the film for you, and both accepting or rejecting it are perfectly acceptable responses. I’ve used the phrase “even though” a lot in this review (response? Think piece? Whatever this is), but I think that sums up ‘La La Land’ pretty well. It isn’t the slam-dunk modern classic some make it out to be, the movie miracle for our jaded times, but even though that isn’t the case, it still has the power to dazzle, move and amaze. And after all the hoo-ha (where the film was posited as either a solution to the world’s recent problems or apparently the cause of the whole thing), the Oscar went to the better film, which was probably a blessing for both - ‘Moonlight’ has secured its place as a masterpiece, and ‘La La Land’ can go back to being the wistful puff of Hollywood romanticism it was supposed to be. The problems and issues will never go away, but lesser films have committed worse crimes. I’ll keep coming back to this beautiful little gem of a film because it makes me feel wonderful and giddy and often exhilarated. That's just my opinion though, and whatever your response you have is totally valid. It might not have been the best film of last year, but based off its unexpected response, it was certainly one of the most fascinating. There is a cynicism to ‘La La Land’ hidden under the romance, a cynicism that actually makes the film a more rewarding experience on rewatching. 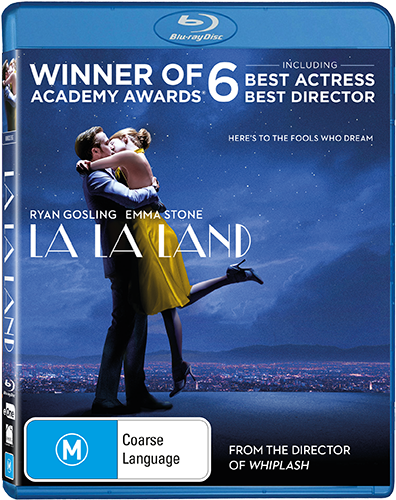 The Blu-ray presentation of ‘La La Land’ is exemplary, making full use of the capabilities of the format. The 1080p 2.55:1 video transfer is gorgeous, bursting with colour and retaining the film’s organic grain and texture. Every frame feels cared-for and loved, and the intricate visual work done in production is beautifully presented here. The real triumph though is the Dolby Atmos 7.1 track, the same released on the U.S. edition. For Blu-ray, the sound has been remixed “specifically for the home theatre environment”, the outcome of which is that many of the poorly mixed moments from the theatrical mix (such as the opening number) have been revised and improved enormously. This is a tremendously robust track, full of life and detail, and as a lover of the film, hearing this improved mix is a joy and a relief. Overall, this is presentation worthy of such a wonderful film. In all, it amounts to an hour and twenty minutes of material, and while it never delves too deep into anything, all the major players in the production speak with honesty and enthusiasm about the making of the film. It also gives us a chance to see how many of the more remarkable moments were achieved, the freeway opening number a particular highlight. The disc also includes demos from Chazelle and Hurwitz for ‘What a Waste of a Lovely Night’ (1:54) and ‘City of Stars’ (3:12), promotional poster material, a song selection and an audio commentary from Chazelle and Hurwitz. All that we lose from the U.S. release are the trailers, but considering most major releases in Australia of late have lacked in comparison to their equivalent U.S. releases, the fact eOne have carried over both the A/V and almost all of the special features is a real blessing. JB Hi-Fi have also released a 2-disc version, which includes a second disc of extras. Both ‘Open Spotlight - Airbnb’ and ‘TCL Chinese Theatre IMAX’ Q&A recordings runs for about half an hour each, but give further insight into the creative process. The only downside to this special edition is the pretty lacklustre alternate artwork, baffling considering the beautiful posters made for the film during release. If you’re a fan of the film though, this is the release to get.